The Tommies' playoff hopes may have been squashed on Wednesday night, but their competitive fire has not been doused, as STU won back to back games for the first time this season, defeating the Dalhousie Tigers 5-3 at the LBR tonight. The Tommies entered the match 3 points up on the visiting Tigers in the battle to avoid last place in the AUS. Tommie Pride surely played a part in the team's strong play this weekend, with the win setting up a rematch next Saturday night in Halifax. Justin Roy opened the scoring for STU at 7:48 of the first, with a wrist shot goal beating Dal's starter Josh Disher off a 2-on-1 break. The Tommies failed to convert on a 3 1/2 minute powerplay though, and Trevor Mackenzie skated from his own blueline to score on Ben MacFarlane to even things up at a goal apiece. STU would get their lead back just 50 seconds later on a nifty passing play from Maxim Chamberland in the corner to Corey Banfield who found Ryan Lehr jumping into the play off the point to score into the open net. The Tommies outshot the Tigers 14-10 in the opening frame. The second period opened with Wesley Welcher firing a laser beam slapshot past Disher at 1:53. At 5:46 Corey Banfield was alone in front to end Disher's night with a goal between the pads. Chris Wall got the call in goal to try and reverse Dalhousie's fortunes. Patrick Sweeney's wrist shot went off a Tommie defender and onto the stick of Chad McCaffrey who forced the puck past MacFarlane to narrow the STU lead to 4-2 at 11:54. At 14:23, the Tigers pulled back to within a goal as Kenzie Sheppard's centering pass bounced off a Tommie defender to make it 4-3. Dalhousie outshot St. Thomas 13-10 in the second period. The Tommies would find the net one more time on this night, as Devan Praught beat Wall for the insurance marker at 15:50 with a good wrist shot. Dal coach Pete Belliveau pulled Wall for an extra attacker with under 2 minutes to play, and Andrew Estey took a slashing call with 1:09 to play, but the Tigers couldn't capitalize despite the 6-to-4 skater advantage, and STU held on for the 5-3 win. In what can only be described as a surprising result, the UPEI Panthers defeat the Tommies 5 to 4 in a shoot out. STU outshot the Panthers 39 to 26 but PEI goalie Elizabeth Legay kept them in the game. UPEI came out gunning in the first, potting the first two goals before the game was 2 1/2 minutes old. Kelly Matthews halved the deficit at 6:13 from Kayla Blackmore as this was the last goal of the period. 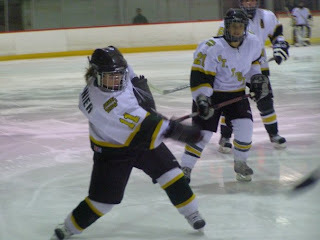 It was all St. Thomas in the second frame as the Ladies would charge from behind and score three goals in the period. Catherine Boudreau got the tying marker at 3:58 from Blackmore and Dube. The Tommies surged ahead on the PP when Sarah Belmore converted the Ashley Duguay pass with the other assist going to Caroline Hammerhiem. The next goal was scored at 15:59 from Charity Walls with the assists to Rossignol and Holt. Jennelle MacKenzie would keep PEI close with their only goal of the period as they were out shot 14 to 4. The Panthers scored the only goal of the third with less than 2 minutes remaining in the game. Janelle Parent scored at 18:07 to force overtime. UPEI rebounded nicely in the frame by out shooting STU 17 to 8. The overtime solved nothing as the Tommies were more dominant throwing 5 shots on net while keeping the Panthers off the shot clock. As the title indicates the Panthers won the game in the shoot out as Janelle Parent scored the winner. Julia Sharun faced 26 shots in total while STU fired 39. Next game for the Tommies is tomorrow afternoon at 2 PM versus Mt. Allison. Next time your at a Tommies game check out Ben MacFarlane's goalie pads. They may be Green and Gold but are taking on a serious black shine with all the pucks being stopped by them in the past few weeks. Tonight was no exception as those pads were worth their weight in gold as Ben made 32 saves for his first AUS shut out victory over the Acadia Axemen. The first period was a scoreless affair with the shot clock favouring Acadia 11 to 6 but credit has to be given to the STU defenders as many of the shots were from the perimeter. When they were in tight, MacFarlane was there. Both teams had two PP opportunities in the period. Acadia held the territorial advantage in the second frame registering 13 shots to STU's 4 but it was the Tommies on the board first. At 6:33 defenceman Ryan Lehr jumped up into the play, stepped in over the Acadia blue line and wired a howitzer past a helpless Kris Westblom in the Axemen net. The slim lead would hold going into the third. Acadia was down to Dalhousie 1 to 0 after 2 periods on Wednesday night and came back to win in overtime, so they knew what had to be done. But it wasn't. On this night it would be the Tommies that would catch the breaks. Maxim Chamberland scored at 5:24 with all the hard work being done by Andrew Andricopoulos, who kept control of the puck along the boards before skating behind the net and finding Max. Twenty-two seconds later Wes Welcher made Acadia pay, as their defence broke down, for goal #3 with assists to Jason Cassidy and Jason Rinzler. STU would take a penalty at 10:24 but Acadia was unable to capitalize and the Tommies came back down the ice to pot one. Devan Praught and Max Chamberland fought for possession of the puck in the corner, drawing most of the Acadia players to them, then finding a wide open and all alone Corey Banfield in front of the net for the gift. After the goal they faced off the puck and Jason Rinzler scored 8 seconds later at 13:14 on a whoopsie by the Axemen to finish out the scoring. The Tommies would shut down Acadia the rest of the way. I owe the folks at stutommies.com an apology. Recall last week's piece, if you will, in which we called to task the anonymous bloggers who want Mike Eagles removed as coach of the St. Thomas Tommies men's hockey team. One of the guys who runs the site wrote to protest, saying that they "humbly attempt to provide a service for Tommies fans by providing a central 'clearinghouse' of information. We post links to Tommies-related newspaper articles (positive and negative). We post links to other websites of interest to Tommies fans (including the Daily Gleaner). And we do allow our faithful readers to comment on the articles and game recaps that they find on our site. It is a selection of these readers, or commentators, that have expressed their opinions on the future of the Tommies and the leadership of the men's program"¦"
It's semantics I guess, but in my mind, when you submit a comment to a "blog" you become a "blogger." The guys who operate the site beg to differ. They suggest those people are "commentators." I defer to their definition. So it's not the bloggers who should shut up or own up, it's the "commentators." Let's face it. The last two "Battles of the Hill" haven't been worthy of the name, or the Roman Numeral Treatment or the tradition. And they won't be until the Tommies upgrade their talent level and make it a real rivalry again. STU fell 9-0 to the $quirrels. With Acadia's 2-1 overtime victory over Dalhousie tonight, the Axemen clinch the 6th and final playoff spot. Daily Gleaner Letter to the Editor, "Invest in STU's hockey team or administer last rites"
Clearly, now is the time for STU president Michael Higgins, the board of governors and all friends of the Tommies to sit down and review this program. Your students are disinterested, your alumni disheartened and your loyal fans disillusioned. You must develop a vision and a commitment to your men's hockey program or call on poor Father Dolan to administer last rights. The status quo is no longer an option. Your men's hockey team is now on life support and losing the battle. 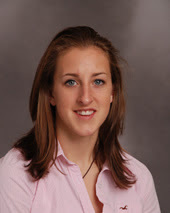 The St. Thomas Tommies have started building on a solid Atlantic University Sport Women's Hockey Conference season by recruiting Katie Brewster and Courtney Fox for next season. Julia Sharun lead her Lady Tommies into battle this afternoon against a hard charging Tigers team and was unbeatable. The game had big implications in the standings as STU had a 2 point lead over Dalhousie for 3rd in the conference. With the 2 to 0 shut out victory the Ladies keep pace with ST FX, who trimmed Moncton in overtime this afternoon. The Tommies withstood a first period barrage by keeping the game scoreless, as the Tigers out shot STU 14 to 5. Jillan Coughlin opened the scoring at 12:36 of the 2nd period and the Tommies out shot Dal. 8 to 4, taking the one goal lead to the dressing room after 2 periods. With her 2 point performance today Lyse Rossignol has 20 points on the season, good for 6th place in the AUS. Jillan Coughlin's goal was her 4th game winner of the season, tied with 3 others for the most in the league. Julia Sharun is amongst the league leaders in all statistical categories including save percentage, wins, and minutes played. Photo Credit: Richard Lafortune. Full set of game photos at Richard Lafortune's Flickr page. The Tommies could have folded their tents after lasts night's disappointing 6-5 overtime loss to Saint Mary's but STU continues to show heart and desire despite a tumultuous season to date. Cheered on from throngs of exuberant students from Vanier and Rigby residences, the Tommies get the hard fought 5 to 4 win over X.
Max Chamberland led the attack with 2 goals and 2 assists on the night, though a game winning assist must be credited to the brightly glad and raucous students. Devon Praught opened the scoring for STU at 3:41 with the well placed wrist shot. However, X would tie the game at 12:37 and out shoot St Thomas 10 -5 in the first period. The Tommies have struggled all season long on the PP but on this night STU's play with the man advantage would lead them to victory. Jason Cassidy's goal at 2:25 of the second would restore the advantage for the Tommies. As would be the case all evening long, St FX would tie the game at 14:04 with Sean Flinn taking full advantage of a defensive zone give away by STU. The Tommies goal scorers were Jillian Couglin, Lucrece Nussbaum, Sarah Belmore, and Dominiqe Bernier. To the left, Dominique lets go with a hard blast. Photo Credit: Richard Lafourtune. I don't know if that title does any justice to anything. What does it really say? It says there were bright spots tonight and the Tommies will be doing battle again tomorrow night after bowing out to Saint Mary's 6 to 5 in overtime. They boys came out ready to fight and it showed when Ryan Murphy scored a highlight reel goal at 1:35 by walking around several Huskies before depositing the puck behind Brandon Verge with a nifty move. Assists to Justin Roy and Brad Gallant. Goal #2 was scored by Jason Cassidy on a goal mouth scramble with Wes Welcher and Jason Rinzler getting the helpers. Before the first was over STU went up three when Andrew Estey made all the right moves after the feed from Brad Gallant. 3 to zip for the good guys after 1 period. Second period roles around and the Tommies fall two men down after successive penalties to Wes Welcher and Bryan Main. SMU scores. St. Thomas gets a 50 second power play opportunity and Jason Rinzler bangs one in from the side of the net with 1 second left in the PP. Jason Cassidy with the good feed and Welcher with his second helper on the night get the assists. 4 to 1 for the good guys heading to the third. Third period comes and the first 6:23 goes along alright but at this time Erick Tremblay gets a protocol violation penalty. OK, SMU scores on the PP. The Tommies come right back 13 seconds later when Devan Praught feeds Corey Banfield who does a little shake and bake to regain the 3 goal margin. This is where the fun really starts. SMU takes a penalty but it is negated a few seconds into it when Bryan Main "hooks" a streaking Husky player. OK. He also gets a 10 minute misconduct. OK. Ryan Lehr gets a "holding" call at 10:27. SMU scores on the 2 man advantage at 12:13 but not before Brad Gallant gets a high sticking call at 11:30. SMU scores at 13:19. With the one goal lead, the Tommies clamp down. At 18:49 Erick Tremblay gets called for "Cross checking". OK. SMU pulls Verge. SMU scores with 17 seconds left. We are going to overtime. In the extra frame Keith Wynn gets called for "interference" at 36 seconds. SMU scores at 1:29 for the win. Here is what I can tell you. STU had 3 minutes and 6 seconds of PP time on 3 opportunities and scored 1 goal on 1 shot. SMU had 17 minutes and 39 seconds of PP time on 14 opportunities and scored 6 goals on 29 shots. SMU outshot STU 60 to 15. Ben MacFarlane took the loss in the STU nets while playing a great game. In today's Daily Gleaner, Bill Hunt mentioned us in his article "Anonymous vultures are circling for Eagles"
My name is Dan, and I am one of the creators/contributors to the stutommies.com website, which you addressed in your column of Friday, January 23rd "Anonymous Vultures are circling for Eagles". I do want to sincerely thank you for the publicity, however I also need to respond to clarify a few points you made in the article. This letter is also being posted on stutommies.com. The most spurious claim of your article is that stutommies.com - "the bloggers" - want head coach Mike Eagles' "head on a platter", due to the difficulties of this year's mens' hockey squad. Nothing could be further from the truth. As you mentioned in your opening paragraph, the website is a place for Tommies fans to congregate. And yes, sometimes to cry. We humbly attempt to provide a service for Tommies fans by providing a central "clearinghouse" of information. We post links to Tommies related newspaper articles (positive and negative). We post links to other websites of interest to Tommies fans (including the Daily Gleaner). And we do allow our faithful readers to comment on the articles and game recaps that they find on our site. It is a selection of these readers, or commenters, that have expressed their opinions on the future of the Tommies and the leadership of the mens' program. These comments can come from anyone, be they Tommie fans, $quirrels, the media... anyone at all. It should go without saying that the opinions of our site visitors do not necessarily reflect those of stutommies.com. We do not edit our comments, except for profanity, vulgarity or personal attacks - which, it should be noted, are few, thanks to the civility of our guests. We, stutommies.com, support the hockey programs - mens and womens - of St. Thomas University unequivocally. Win or lose, no matter the players, coaches, leadership in place, we support our teams. To the subject of anonymity, we agree. We are anonymous. Why? Because the site is not about us. It's about STU. We do not seek attention. And being anonymous, we do not pretend to be journalists. We do not "break stories". We do not engage in rumour-mongering. We simply provide a central source of information, and some occasional cheerleading, for the Tommies. One final point of clarification. We at stutommies.com are completely independent. Your capitalization of the "F" in "Friends" may have been an editorial error, or intentional. It's not for us to say. But we are not affiliated in any way with the Friends of STU Hockey. We do provide a link to the CKTP radio broadcasts, and play-by-play announcer Randy Corey provides live updates from the road. Neither he nor the station are affiliated with the website in any way. Tommies player and Journalism student Jason Cassidy has agreed to repost his Aquinian articles on stutommies.com. However, neither he nor the Aquinian are affiliated with our website. We appreciate your coverage of local sports, university hockey and the Tommies. However, we respectfully ask that you take the next available opportunity to clarify and correct the inaccuracies and ambiguities in this particular column. Nominations for the first class of Wall of Famers may be submitted to athletics@stu.ca. While it's not firmly established as a criteria, [athletic director Mike] Eagles believes the first crop will acknowledge and reflect STU's Miramichi roots. St. Thomas' roots can be traced to St. Thomas College, a secondary school and junior college founded by Basiilian Fathers in Chatham in 1910. St. Thomas relocated to Fredericton in 1964 and now has a student population of 2500 and a faculty of 120 full-time staff. I have noticed that everyone seems to have this big plan in their heads for themselves. “I’m going to be the best, most spectacularly extraordinary, successful and rich person when I grow up”. We are setting ourselves up to believe that anything less than perfection is failure. Pop culture gives us the impression that those who are failures are generally poor, powerless, unpopular and physically unattractive. With this, we have created a culture of fear and avoidance of failure. It’s quite evident in athletes. Like it or not, we are all afraid to make mistakes. Some athletes are so plagued by the thought of coach yanking me after a missed opportunity they lose all focus. Many athletes hinder their potential by focusing on avoiding mistakes instead of believing in their ability. One could argue that this fear illustrates your passion and care for sport. You want to be successful and portray yourself as this wonderful gift from God. However, I think people portray this image because they’re looking for social approval. They need to be confirmed and validated in society to show their dedication. Let’s face it; we want the approval and respect of our peers. Whether you have been an athlete for only a short while or have been into sports for 30 years, the fear of letting others down can lead to substandard performances. Then I wonder. Do you compete for yourself or for others around you? It’s a tough question. Many people find it difficult to admit that they actually compete to gain acceptance from their teammates, family members, coaches, and so on. Doubt has got to be the number one killer of confidence. Pessimistic or perfectionists tend to hold onto doubts, essentially dragging down their mind and effecting performance. Think about it, you’re preparing to play the top team in your league and the first thing you say is, “how are we going to beat these guys tonight?” Before the competition has even begun, we are looking for answers. To put it all into perspective, Failure is inevitable. It is an essential part of life that we cannot avoid. It gives motivation to overcome difficult challenges. It shows you exactly what you’re doing wrong and forces you to take ownership over your problems. It teaches you to be determined and committed to your dreams. It forces you to persevere. "We're obviously in a rebuilding mode, and Andrew [Andricopoulos] has been an impact player for us," said Tommies' coach Mike Eagles. "Obviously, he's going to be a very good player in the long term here. We're very happy he's with us and he's doing a good job for us. We need more players of that calibre at all positions." "If not for better masks, goalies couldn't come out and just drop (down and face shots),'' Smith said. "There have been different types of innovation and equipment. Today, goalies are athletes. They're not as flaky. You look back and guys like Gerry Cheevers smoked and Gump Worsley wasn't exactly a specimen. The Tommies' long season continued this afternoon at the LBR as they entertained the UPEI Panthers. The Tommies came out strong early in the game, but special teams for UPEI were STU's undoing in the first period, as Justin Donati scored on the powerplay at 6:44 to make it 1-0. Then at 10:40 goaltender Matt Davis mishandled a puck bounce off the back boards and Panthers captain Rick Steadman was in prime position to make him pay, depositing the easy backhand into the net for a shorthanded goal and a 2-0 Panthers lead. Ryan Murphy gave Tommies fans some hope, pulling STU to within a goal after a nice feed from Maxim Chamberland at 3:36 of the 2nd period, but the Panthers connected again on the powerplay with a blistering Howie Martin wristshot at 5:41. UPEI rounded out the second period scoring with an Iain McPhee point shot to make it 4-1. Neither team would score in the third period, and the Panthers leave Fredericton with a 4-1 victory over STU, who fall to 2-14-3 on the season. Next up for the Tommies - a pair of weekend tilts against Nova Scotia opponents at the LBR; Saint Mary's on Friday night and St. F-X on Saturday night. Both games are 7:00 pm starts. You win some, you lose some. Last night the Tommies lose a heart breaker to Moncton, tonight they win a thriller versus Saint Mary's. And what a game it was with the Tommies scoring 2 late third period goals to tie and then the overtime winner for the 4 to 3 victory. The Huskies came out gunning in this one and took the lead in the first period on the PP at 14:20. They out shot the Tommies 12 to 8. The second period rolled around and once again SMU was the only goal scorer as their power play clicked again early at 1:06 to see STU down 2 goals. The third period started off in St Thomas' favour when Sarah Belmore scored at 6:12 on the PP but SMU regained the two goal cushion with just over 3 minutes to play when they scored their third PP goal of the night. Things didn't get any better for the Green and Gold when Kayla Blackmore took an interference call at 17:33. Down 2 goals and one player the seemingly impossible happened next. Michelle Goguen scored short handed at 18:21 to cut the lead to one and then with Julia Sharun on the bench for the extra attacker and with only seconds left on the clock, former Huskie, now Tommie, Lyse Rossignol scores to tie the game!! With the momentum on their side the Tommies won the game in OT when Nicole Dube took the Caroline Hammerheim feed at 2:20. Huge comeback. Julia Sharun snags the victory from the clutches of defeat facing 23 shots while STU fired 34 at the Huskies. The win keeps St. Thomas in a tie for second with ST FX who beat PEI 10 -2. Considering the Tommies' awful start to the 2nd half and their slim-to-none playoff hopes rapidly evaporating, it's good to see they haven't packed it in for the season. Overall, a good effort tonight and an exciting game. Devan Praught tied the game on the powerplay - the 3rd goal on the night with the man advantage. Unfortunately, Jean-Philippe Paquet's shorthanded shot from center fooled Ben MacFarlane to make it 4-3, then Mathieu Berube scored the empty netter in the dying seconds for a 5-3 final. STU hosts UPEI tomorrow at 3pm at the LBR, with the game on CKTP.Thanks again for reading, and listening. Another pretty good period for the Tommies starting with a beautiful give and go power play goal by Devan Praught from Jason Cassidy. Moncton stepped it up after falling behind and Nicolas Laplante took advantage of a deflected Jean-Phillippe Paquet point shot to tie it up. The Tommies had some quality scoring chances in the 2nd, but couldn't capitalize. A one-timer from Ian Girard, that he fanned on a bit threw off MacFarlane's timing as he came across the crease and it got by him for Moncton's 3rd goal. Shots 12-10 for UdeM, 24-16 overall. 3-2 Moncton after 2. That's the best period of hockey from the Tommies since the 2nd half began. Not to say that STU didn't have its issues in the defensive zone, but they had a few quality scoring chances, including one that Maxime Chamberland inexplicably rang off the goal post, but the Tommies made up for it not long after with Wes Welcher's goal, a beauty setup from Andricopoulos and Gallant. 1-1 after 1. The nationally seventh-ranked Universite de Moncton Aigles Bleus needed a shootout to edge the St. Thomas Tommies 2-1 in AUS Women's Hockey Conference action Friday night at the J. Louis Levesque Arena. Tommies fall 8-0 to the $quirrels. Check back in the morning, we'll post the complete dissection from tomorrow's Gleaner. We know you're hurting, fellow Tommie fans. So are we. But don't stop believing. This too shall pass. [Mike] Eagles is a former coach of the year in both the AUS and CIS, so it's not like he suddenly doesn't know how to relate. The school itself is limited population-wise and hasn't got as varied an academic program as some, but that's always been the case. Hard-work doesn't intimidate Eagles. That's why he doesn't buy into the notion that assuming duties as athletic director to go along with coaching in September has had a negative effect on the hockey program. "I'm prepared to do the work,'' he says. It remains to be seen if the power-brokers at the school are of the same opinion. "We didn't really point fingers at each other. We all looked at ourselves in the mirror and accepted some of the blame for what happened," said second-year winger Max Chamberland after the Tommies were embarrassed 10-2 by the Saint Mary's Huskies and 10-0 by the St. Francis Xavier X-Men in a pair of Atlantic University Sport Men's Hockey Conference mismatches. "We're proud to be part of this program and we want to see it be successful," Chamberland said. "Obviously, we're mad after a weekend like that." [New Maryland's Lyse] Rossignol had the game winning goal for STU in Saturday's win over UdeM and added an assist as STU lost 4-3 in overtime to Dalhousie on Sunday. It was another close game this afternoon at the LBR and the Lady Tommies came within 3 seconds of pushing the game to a shoot out. It wasn't to be and Dalhousie came away with a hard fought 4 to 3 win. STU started off strong when Kyla Blackmore scored her first of 2 goals at 8:11 of the opening frame with assists to Bernier and Rossignol. A few minutes later they went up by 2 goals when Sarah Belmore converted on the pass from Duguay and Hammerhiem. The Tigers replied shortly after on the PP and cut the lead in half. The Ladies out shot Dal. 14 to 4. There was no scoring in the second period and the shots favoured STU 13 to 10. Kayla Blackmore would get her 2nd goal of the game from Lucrece Nussbaum in the third but penalty trouble would be STU's ultimate undoing on this day. The Tommies had players in the box for both of the Tigers goals in the fianl period and the game winner with 3 seconds left in OT. Final shots on goal were 38 to 30 in favour of the Tommies. Julia Sharun takes the tough loss in net. Thanks to Randy Corey for the blogs this weekend. It couldn't have been easy. What's left to say? A tough weekend for the Green and Gold. 4 more goals in the third make it a 10-0 final. Thanks for reading and for listening. Next up - UNB on Wednesday night for the Lou Chabot Memorial Game at the LBR at 7pm. A game that looked like it was showing some promise for STU has unfortunately turned into another disappointing game. Not for lack ofeffort, but the Tommies are simply outmatched by St. F-X who are on a roll right now. Brett Robertson scored a nice breakaway goal to make it 2-0, then Brett Liscomb cashed in for a 3-0 lead, at which point you could almost hear the expulsion of air as the Tommies hopes deflated. Chris Hulit has since added the natural hat trick to make it 6-0. Shots on goal 22-10 for X in the 2nd, 34-18 overall. 1-0 X-Men after 20. A much better effort from the Tommies so far. Jeff Caron's PP goal at 6:32 is all so far, in all fairness, a weak call against Scott Judson. The X-Men are running into injury trouble, with both Phil Mangan and Rob Warner going down. Warner is still at the side of the St. F-X bench being attended to. 12-8 shots on goal for X.
Warmups are underway here in Antigonish. Guillaume Misczak (0-1, 6.82,.848) is starting for STU. I'm afraid I didn't see who led X onto the ice, though Ryan Aschaber (0-0, 1.37, .958) is getting the bulk of the warmup time so I'm going to speculate he'll start. Tune in to the broadcast to find out, I guess. Jeremy Turgeon, David Crossman and Ben MacFarlane are sitting tonight for the Tommies. EDIT by STUTOMMIES.COM: As mentioned in the comments below, I dropped the ball last night and would like to apologize to the readers of the site. Thank you to Randy Corey for the blog and we look forward to reading and listening to the game tomorrow night. Another tough period for the Tommies. STU played well the first 5 minutes of the 2nd, but another power play goal by Cody Thornton deflated any comeback hopes. Andricopoulos and Wynn got tangled up in their own zone leading to Colby Pridham's goal to make it 5-0, but the Tommies ended the period on a positive note with Jason Cassidy's power play goal. I appreciate all of you with the fortitude to stick around for the 3rd period. I hope to be back with another live blog tomorrow night at St. F-X. The Tommies making too many mental mistakes in the 1st period. Jon Howse, Cody Thornton on the power play and Scott Hotham after Keith Wynn put it right on his stick. The Tommies had a couple of chances on the power play, but it was unfortunately short-lived after Davis' delay of game penalty. Though in Matt's defense, he had to scramble after the Tommie defenders allowed Kyle Doucet to sneak by them for a near breakaway. Tommies start the 2nd on PK, 30 seconds remaining in that delay of game call. I'll be back in the 2nd intermission. Pregame Warmups are underway at the Forum. Cory Chipman (0-0, 5.28, .833) led the Huskies onto the ice so it appears he'll start and be backed up by Brandon Verge. Matt Davis (2-7, 5.46, .854) starts for STU, with Ben MacFarlane on the bench. A couple of notable scratches for Saint Mary's. Andrew White, a first year Huskie, is not in the lineup. If memory serves, I read last week that he has returned to Junior A. If someone out there can confirm that, feel free to email me at randycorey(at)gmail.com. Also, steady defenseman David MacDonald is scratched for SMU. I can only assume he's injured. I'll try to confirm and let you know on the broadcast. 25 minutes 'til game time, back in the 1st intermission. My name is Jason Cassidy and it's an honour to have been invited to contribute to the site. While studying journalism at St. Thomas, I write a bi-weekly column that is published in the school newspaper, The Aquinian. For those who are unable to pick up a copy around campus, I will be posting my articles here to give you a bit more insight into the life of a student athlete. I want to thank STUTOMMIES.COM for giving me this opportunity and I welcome any feedback or concerns from the readers. I often wonder where I would be today if sports were not apart of my life. Would I be in New Brunswick attending St. Thomas? Would I be completing a degree in journalism? Would I be writing for the Aquinian? Probably not! More importantly, where would I be today without the relationships I have formed and the experiences I have shared with such wonderful individuals? Athletes are bread to win championships. It is instilled into their mind at a very young age that winning is everything. Though I am quite certain that once the journey is over, and it becomes time to call it a career, most athletes will remember the friendships. The experiences they have gained and the appreciation of teamwork they shared with others. Memories last a lifetime. Very cliché, but memories shape an individual and help to guide them through the trial and error periods throughout life. The sporting world is extremely cut throat and you can be sure it will throw many challenges in your way. It is important to understand how to channel those experiences to improve yourself not only as an athlete, but as a person. This column will explore the many highs and lows that my fellow St. Thomas athletes and I have endured, and how those challenges have shaped us as individuals. Please be sure to send in your feedback and share the ever lasting memories that have changed you as a person! Wow. Hard to believe how far STUTOMMIES.COM has come since first going online just over 3 years ago. At around 2:45 yesterday afternoon, we had our 25,000th visitor to the site, and over 8,000 since we unveiled the new format last July. Thanks to everyone who has made STUTOMMIES.COM a regular part of your Internet surfing routine. Remember to tell your fellow Tommie fans about the site, and of course you can subscribe to our site feed with the link on the sidebar so you'll be notified of updates as they happen. We're hoping to continue growing with new features in 2009 including the introduction of another new contributor to the site in the days to come, so keep visiting! Lucrece (Lukie) Nussbaum, a 22 year-old Women’s Hockey Tommie, battled hard for her homeland when she joined the Swiss National team at the MPL Nations Cup (formerly known as the Air Canada Cup) held in Ravensburg, Germany. After three games, Nussbaum finished 2nd in scoring for Defense in the tournament and 7th overall in scoring. Remarkably, she also led her team in scoring from the defense position. She is happy with the team’s results at the tournament noting that while they didn’t finish as high in the standings as they would have wished, the coaches had the opportunity to try new line combinations for the upcoming World Champioships in Finland. 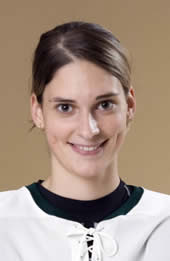 During her 2007-2008 season with the Tommies, Lukie took home the Top Defensive Player award and also assisted the Swiss National team in a monumental way. Nussbaum’s strong skills helped the Swiss team qualify for the 2010 Olympics to be held in Vancouver. Spectators need not worry, in the interim the top performer will continue to make the Tommies proud with her strong work ethic and dedication to the team. Come and cheer on the St. Thomas Men’s Hockey Tommies on Wednesday, Jan. 14 at 7:00 pm at the Lady Beaverbrook Rink for the annual Lou Chabot Memorial Game against the University of New Brunswick. The box office at the Lady Beaverbrook Rink will open at 5:30 pm on the afternoon of the game. Prior to the game, there will be an Alumni & Friends Reception from 5:00 pm to 6:30 pm at the St. Thomas University Forest Hill Conference Centre (Pine Room) at 368 Forest Hill Road. Our guests of honour will be Lou's mother, Pauline Chabot, and family members. Share memories, connect with former classmates and raise a glass in honour of Lou, a remarkable individual. We look forward to seeing you. Refreshments will be provided. NOTE: If you would like to reserve your seat at the Beaverbrook Rink prior to attending the reception, you may do so at 4:30 p.m. We will have someone at the “Beav” to ensure that your seat is not taken while you are at the reception. Game tickets will be available for purchase at the reception ($8 Adults $5 Seniors). Parking passes at the LBR will also be available for those attending the reception. The Tommies were back in action on Saturday night for the first time after the long Christmas layoff, visiting les Aigles Bleu at the J. Louis Levesque Arena in Moncton. Both teams played even over the first few minutes of the first, but then the Blue Eagles took advantage of the Tommies' tentative play and began to carry the play. Moncton outshot STU 9-1 over the first 10 minutes of the period, and opened the scoring at 9:06 as Corey Banfield lost control of the puck in front of his own net and Remi Gautreau took advantage, beating starter Matt Davis for the 1-0 Moncton lead. The Blue Eagles continued to carry the play throughout the first frame, although the Tommies caught a break in the waning moments. With Alexandre Soucy serving a too many men on the ice penalty for Moncton, new Tommie Andrew Andricopoulos drove down the left wing side, threw the puck on net, and the disc found its way behind Pier-Alexandre Marion as time expired. The teams would head to the dressing rooms tied at a goal apiece. The Blue Eagles outshot the Tommies 11-7 over the first 20 minutes of play. The Tommies seemed to find their legs in the second period. At 1:30 of the middle stanza, Corey Banfield fed a pass from behind the net to Maxime Chamberland, whose backhand would put STU up 2-1. Moncton would extinguish the lead at 9:28, on a delayed penalty against the Tommies, Marc-Andre Bureau showed off his soft hands after a rush down the right wing, putting the puck behind Davis to even things up. Davis would then give up the crease to Ben MacFarlane, as Coach Mike Eagles' plan was to play both his goalies on this night. Just 36 seconds after Moncton's equalizer, Jeremy Turgeon beat Marion with a nice hard wrist shot to re-establish the lead for the Green and Gold. Moncton outshot the Tommies 14-11 in the second for a 25-18 lead thus far, but STU took the one goal lead into the break. The Tommies would, however, fall back to their bad habits of the first period as the third got underway. At 5:07 Guillaume Parenteau was in position to take advantage of a short-side bounce off the back wall, and deposited the puck top shelf past MacFarlane to tie the game at 3-3. Moncton would take the lead at 10:26 after MacFarlane made the initial pad save off a Remi Doucet shot, but the big rebound went straight to the stick of Patrick Lockyer who found the back of the yawning cage for a 4-3 Blue Eagles advantage. The Tommies continued to battle, however, evening the score once again as Devan Praught was "johnny-on-the-spot" in the crease, taking advantage of a Corey Banfield rush with the tap-in to make it 4-4. But STU would not taste victory on this night, as a pair of Blue Eagles goals from Ian Girard at 12:49 and Guillaume Parenteau with his 2nd at 14:21 would put the game out of reach. The Tommies would pull back within a goal at 15:06 as Wes Welcher re-directed an Andrew Andricopoulos point shot to make it 6-5, but at 17:36, with the Tommies shorthanded, Erick Tremblay gave the puck away in the defensive zone and Remi Doucet was left alone to score the easy insurance goal. Final score 7-5 in favour of Moncton. The Blue Eagles outshot the Tommies 40-28 on the night. Notes: Brian Soso is no longer with the Tommies. Andrew Andricopoulos impressed in his first action with STU, scoring a goal and adding two helpers. The Tommies are back in action as the regular season resumes Friday night (Jan 9th) @ St. Mary's. January 5th and the regular season resuming on January 9th, both teams believe it was in their best interest to cancel the game.